Days after being sworn in, Trump has been served. Two days after staff at Donald Trump’s Washington hotel dropped balloons and popped champagne corks to salute his inauguration, America’s first billionaire President was put on notice – he is being sued because of profits that the hotel and other businesses earn from foreign governments. “The founders of our country were so worried about foreign governments paying cash and giving other benefits to an American president, and the distortion that can have on a President's decision making, that they put a prohibition on it in the Constitution,” said Norm Eisen, a former White House ethics counselor to President Obama. Eisen helps run the non-partisan watchdog group Citizens for Responsibility and Ethics in Washington, or CREW, which filed the suit in federal court in New York, calling President Trump’s continued ownership of his vast business empire a violation of what’s called the “emoluments clause” of the U.S. Constitution. Trump brushed off the lawsuit with just two words Monday, calling it “without merit,” but he also “resigned from all position of management and authority with the Trump Organization and its affiliates,” according to a statement for that organization. “President Trump also transferred title, management and authority of those companies to a trust, or subsidiaries thereof, collectively managed by his children, Don and Eric, and longtime executive and chief financial officer, Allen Weisselberg,” the statement also said. A copy of the resignation letter dated Jan. 19 -- the day before the inauguration -- seen by ABC News reads: "I, Donald Trump, hereby resign from each and every office and position I hold in the entities listed." A list of business holdings follows his signature. 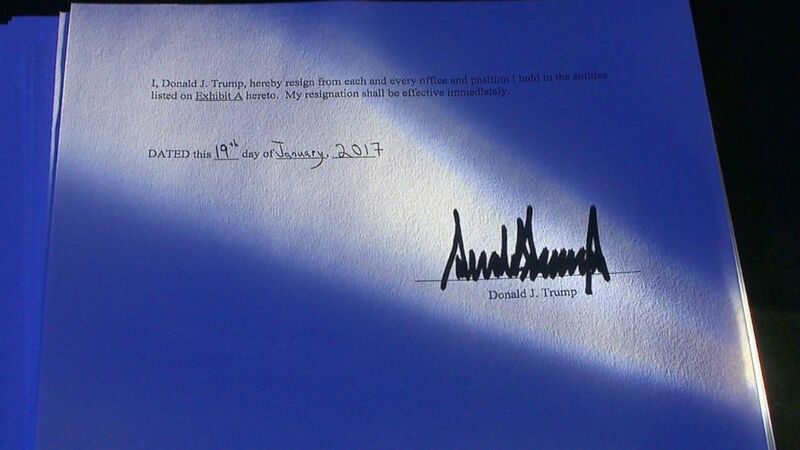 (ABC News) A copy of the resignation letter dated Jan. 19, 2017 -- the day before the inauguration -- seen by ABC News reads: "I, Donald Trump, hereby resign from each and every office and position I hold in the entities listed." But ethics and constitutional scholars, as well as some members of Congress, have been sounding alarms about the potential violation for months. Many assumed Trump would relinquish control of his business empire in order to put the issue to rest. Instead, during a press conference earlier this month, Trump announced that he would not give up ownership. Trump lawyer Sheri Dillon said at the time she had taken efforts to iron out potential conflicts by transferring operation of the company to Trump’s adult sons, Don Jr. and Eric Trump. That, said Harvard Law Prof. Laurence Tribe, is not enough. The Trump International Hotel, just a few blocks down Pennsylvania Avenue from the White House, may be of greatest concern, Eisen said. In one of the great product placement campaigns of all time, Trump twice showed up at his new Washington hotel before being sworn in, complimenting himself on its design. Among the claims in the lawsuit – taking money from foreign governments to rent rooms at the hotel violates the Constitution. Eisen noted that officials from Bahrain chose the hotel just a few weeks ago to hold a reception. And others are likely to follow. And the hotel is not the only concern, according to the case. Anything from foreign interests leasing space at Trump Tower in New York, money from development deals, even foreign residuals from his TV program the Apprentice, could create an issue. The President has said he is trying to resolve the matter. He told reporters, for instance, that he would channel hotel profits from foreign governments to the U.S. Treasury. ABC News’ Paul Blake, Cho Park and Alex Hosenball contributed to this report.